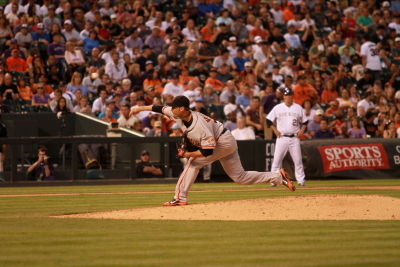 Lincecum Fall and holds onto the Ball! Giants vs. Rockies game 3 of the series. 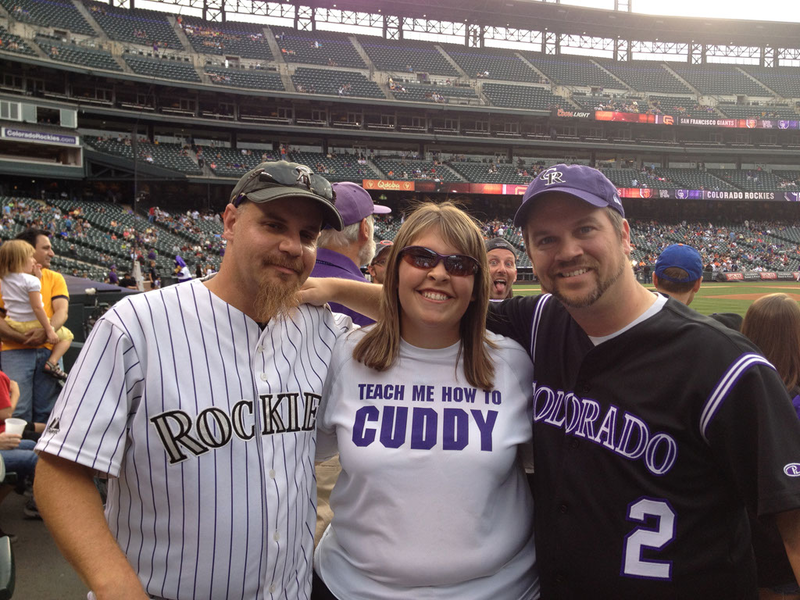 My 22nd game at Coors this year! 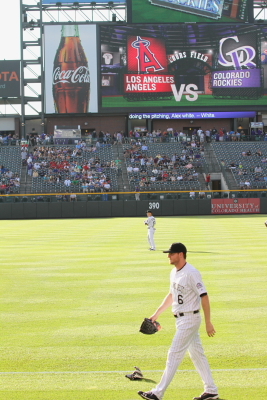 After Friday Nights Win it was great to be back at Coors. 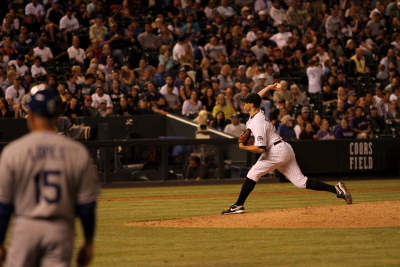 With the series split the Rockies need this one against the 2 time Cy Young winner Tim Lincecum. Tyler Chatwood was called back up from Colorado Springs after being up for a 2 starts one against the Braves at Coors and one against the Dodgers in L.A. it was a very good start for Tyler. The Rockies did win both games he pitched this year. 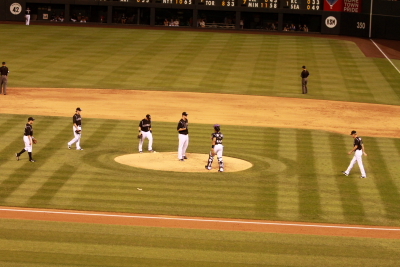 Here is a photo of Jerry Weinstein, Wilin Rosario, Tyler Chatwood and Jim Wright coming in from bullpen. Really like the contrast in the photo and I don’t mean of the BNW, I mean how Tyler is in Game mode with his coach and Wilin and Jerry are just have a good time laughing and smiling. Here is Tyler Chatwood throwing the first pitch to the Giants Angel Pagan. Pagan would ground out to first to start the game with an out. 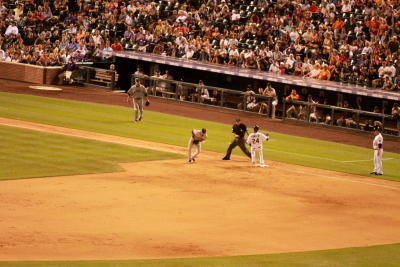 The second batter Marco Scutaro reached on a single. he would get out at second when Pablo Sandoval hit into a double play. 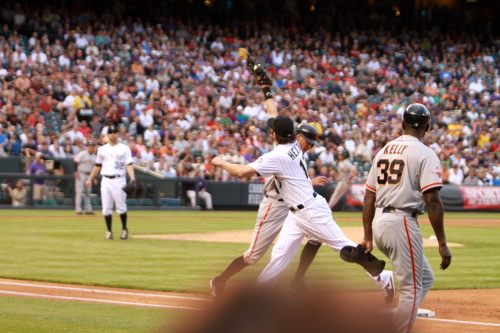 That ended the first inning for the Giants. Tim Lincecum who has been one of the coolest away player to the fans signing a lot throwing his first pitch of the game to Dexter Fowler. 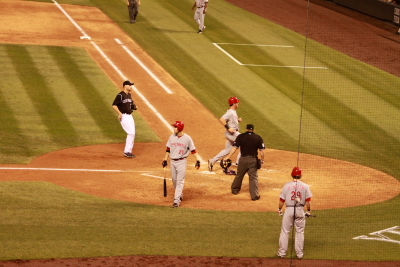 Fowler grounded out to third base. 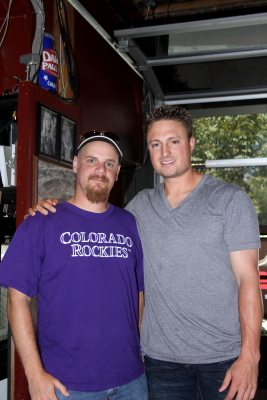 Josh Rutledge would also get out and Carlos Gonzalez was walked. He than stole second and advanced to third on a really bad of the mark by Buster Posey that Marco Scutaro could just not get to and it headed to center field. 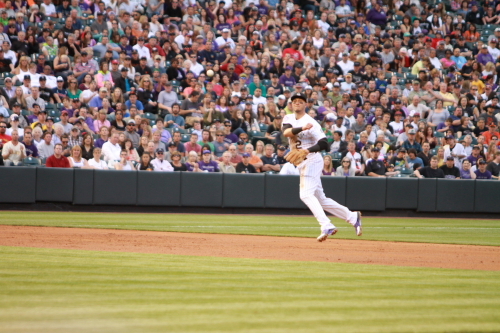 Troy Tulowitzki would ground out to Brandon Crawford at short. 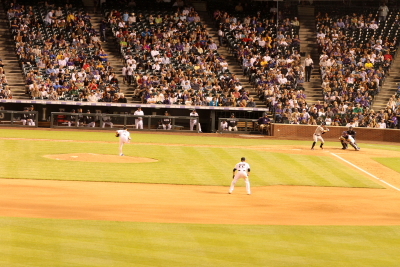 Crawford throwing to first to get Tulo at first. 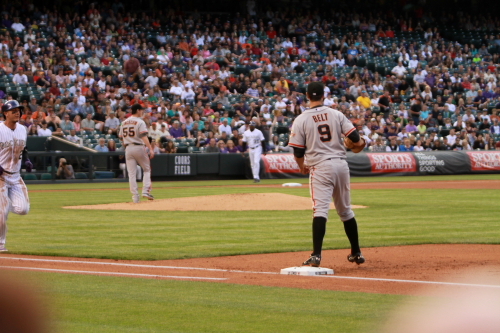 Brandon Belt stepping on first for the 3rd out of the inning. 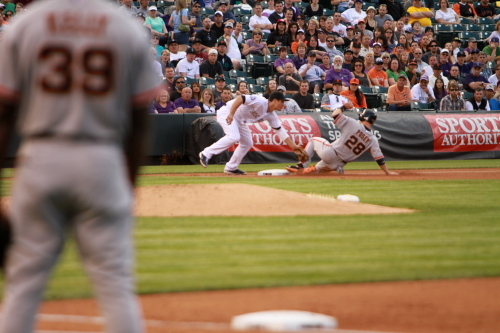 Buster Posey get caught stealing at third in the 2nd inning this was an important out. It would have resulted into a second run in the inning. Posey would have scored on a Brandon Belt double. 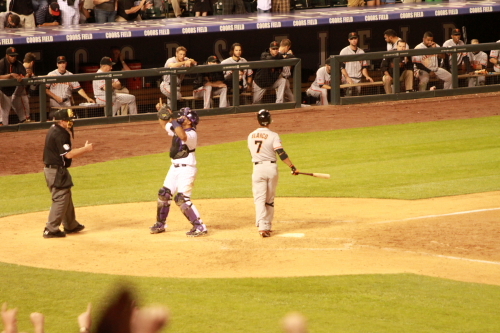 Belt did score on a Gregor Blanco single for a Giants 1-0 lead. Posey being called out by third bas umpire Bob Davison. 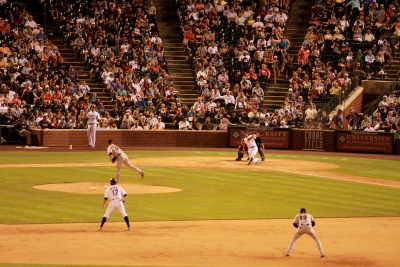 Troy Tulowitzki does the cross body throw to first. To get Hunter Pence out at first in the 3rd inning. The Rockies did take the lead in the 3rd inning. The scored 3 runs on good old fashion small ball it is amazing that it actually works a lead off walk to Charlie Blackmon, he would advance on a Tyler Chatwood sac-bunt and would score on a Fowler double to left field. 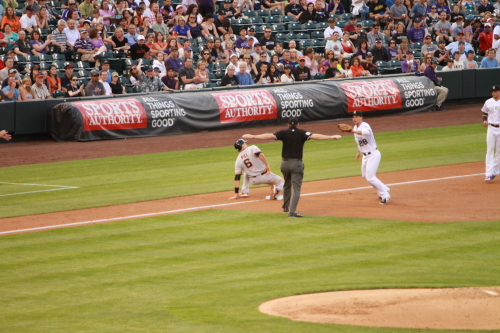 Fowler scored on a hit ball by Josh Rutledge to Tim Lincecum who had a bad throw to first and advanced to third base. It was a real rough night for Tim he had a few footing issues while pitching once just slipping and the second in the 4th when he pretty much fell off the mound held onto the ball and it was called a baulk. 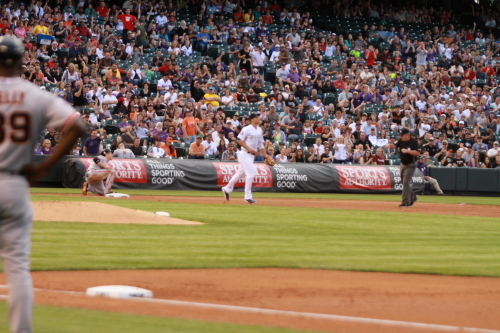 It did advance Nolan Arenado who was at first after he hit a single. After the 4th inning the Rockies had a 4-1 lead. 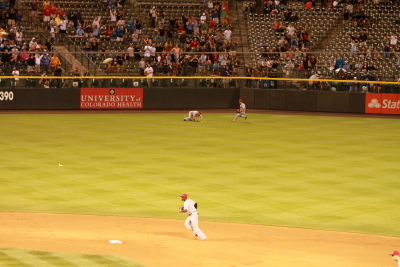 Here is Josh Rutledge sliding into third after the Lincecum error in the 4th inning. After a very good start for Tyler Chatwood after the pinch hitter Nick Noonan was announced the Rockies made a switch of their own. Bringing in Josh Outman. The Giants than pulled Noonan and had Joaquin Arias pinch hit. So after a good outing where Chatwood only allowed 1 run in 5 2/3rd innings on 7 hits and walking and striking out 4 batters. It is great to see he held the base runners from 7 hits from not scoring. 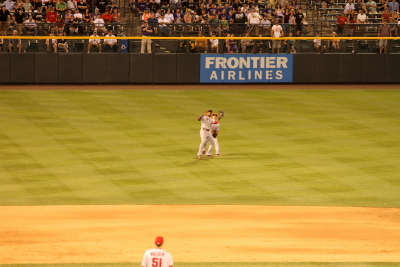 Dexter Fowler getting into the head of Giants relief pitcher Jean Machi in the 7th inning. Who was called up from their triple A affiliate Fresno Grizzly’s that day. 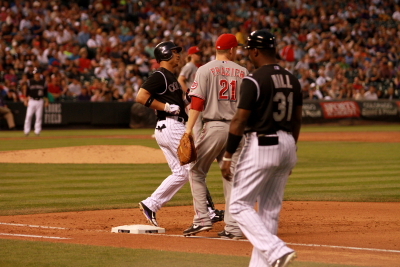 He did go on to steal second and score 1 more run on a Rosario single. That was Rosario’s 3rd RBI of the game. 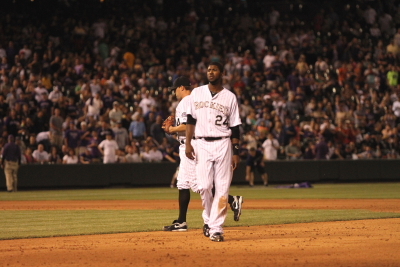 The Rockies went on to score 3 more runs in the 8th inning. 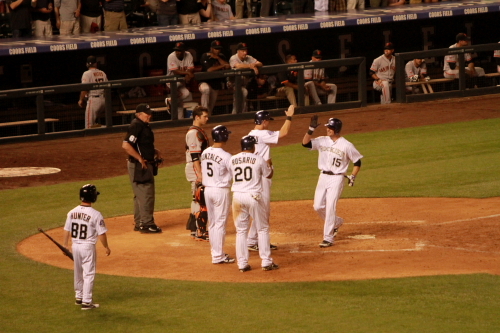 Before the Rockies got their 3 the Giants did manage a run also in the 8th. Hunter Pence scored on a Brandon Crawford single. Pence lead off the inning with double. 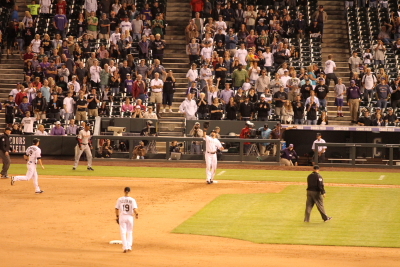 Todd Helton flips the ball to Wilton Lopez to end the game. 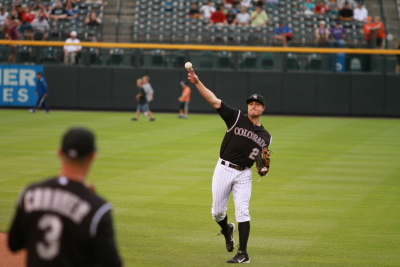 Lopez replaced Outman in the 8th. He finished the 8th and pitched well enough to only face 3 batters. 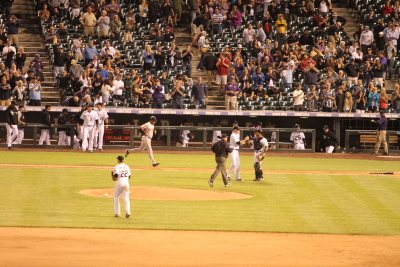 the Rockies won their second game in a row against the Giants and is the first time they won 2 in a row in about 3 weeks. great to see the bats start to come alive again. 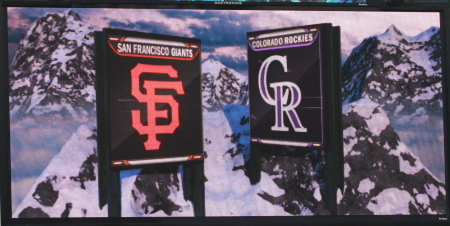 The Giants throwing errors and miss played balls helped but we had to hit them to the right spot for those to make the difference and using them to the Rockies advantage. The Rockies 1 this game 10-2 and out scored them 20-11 in the last 2 games. After this game the Rockies are now 2 games behind the 1st Place Diamondbacks and 1 game behind the Giants in the National League west. This week will only keep getting more interesting as we face the Diamondbacks for 3 games. There is one more from this series a Sunday game and a Dante Bichette bobble head day! Giants vs. Rockies game 2 of series. My 21st game of the year. I got down to Coors after 5P.M. which is rare for me but I headed in and The Giants were taking batting practice and it was their 2nd or 3rd group. So I was just hanging around in the pavilions and I caught my 3rd baseball of the year. This one is going to be quick. After Brandin Pill hit a double to start the 2nd inning for the Giants he advanced to third on a Andres Torres fly out to center field. He would score along with 2 other runs in the inning. 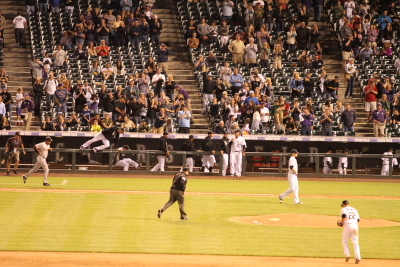 (4-0) Rockies The Rockies got 1 back in the bottom of the 2nd and they would tie the game at 4. 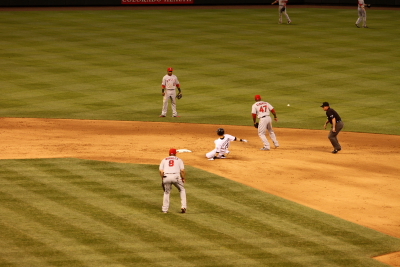 Wilin Rosario scoring the run in the 2nd. 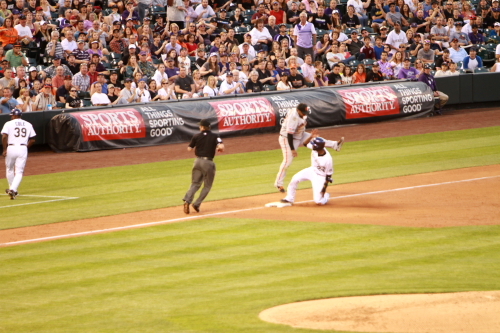 Dexter Fowler sliding into 3rd after and than would score on a bad throw from Angel Pagan to third. 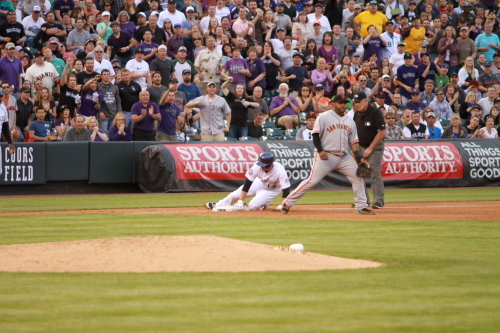 This must of a scary moment for Dex as Sandoval took to the air! The Giants took a 5-1 lead in the 4th. 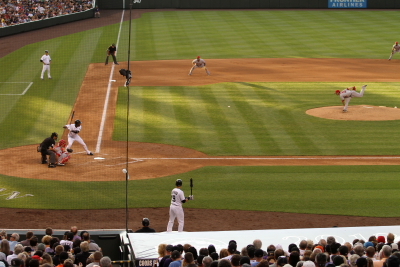 Rosario at bat in the 3rd inning. he would strike out in the inning, but could not pass up the shot! Jordan Pacheco came up in the 5th inning with bases loaded and 2 out. I was like wow this should get us a run or 2 since he hits well under pressure and is good for a single or double which can get the Rockies 2 or 3 runs and would take the lead. Instead he hit a home run to left field scoring Cargo, Rosario and Lemahieu as well as himself to give the Rockies a 9-5 lead. 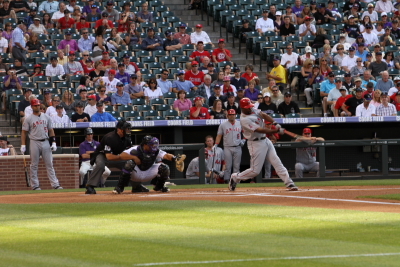 Fowler also scored earlier in the inning. The Giants did get 3 runs in the 7th and an additional 1 in the 8th. 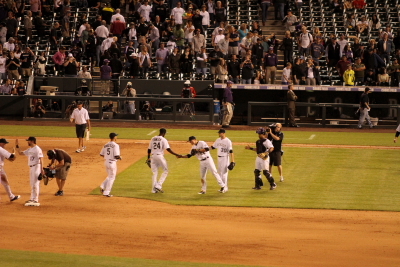 They did fall short of the win by 1 the Rockies took this one 10-9 as the final this was a much needed win for the Rockies and it was great after the disappointing lose the night before. Rosario points to the sky after Rafael Betancourt struck out the sides in an incredible save for him. 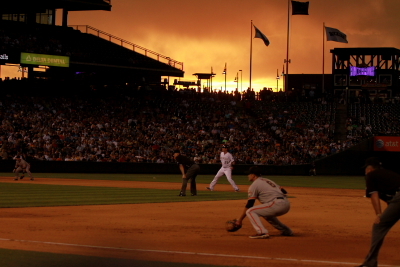 This was Gregor Blanco make the final out of the game. 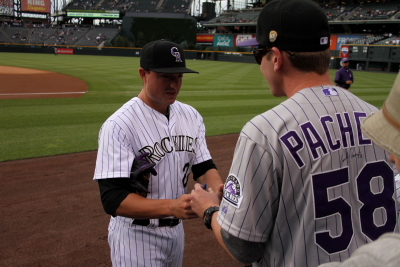 This broke a 10 game losing street for the Rockies against the Giants. That’s it for this one still got 2 games against the Giants this weekend. Remember you can follow me on Twitter @roxaddict. 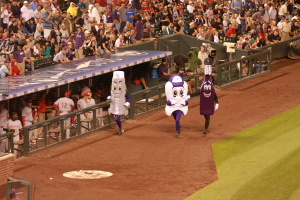 Short Sweet and The Rockies Got Beat! My 39th Game at Coors should have stayed home!!! I came right from work and arrived a little late to BP I came close to one ball slightly after I arrived hit by the Giants but the kid in front of me with some really good vert got it nice catch! I did not get one. This BP. I headed down to the wall and the usual guys signed Rutledge, Colvin, Pacheco and Helton Very Cool to see Todd Signing been catching up on all the thing I have for him. But I did not get him today. 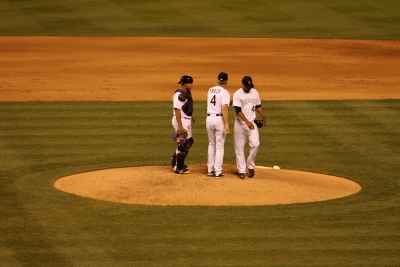 Me, Amy (Take From Blake) and Jared Dean (Rox Walk Off). Photo is from Amy’s camera mine did something stupid and the photos did not come out! 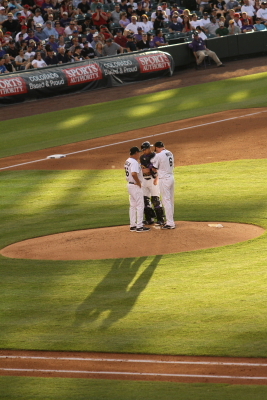 Jonathan Sanchez was the starting pitcher for the Rockies he pitched terrible. He did get himself out of many situations and did only let up 2 runs in his 3 innings he pitched. He also walked 3 and struck out 1. He had a very high pitch count 100 in the 3. Hey look its Ryan The Riot!!!! He hit a single in the first He also got a RBI scoring Pagan. 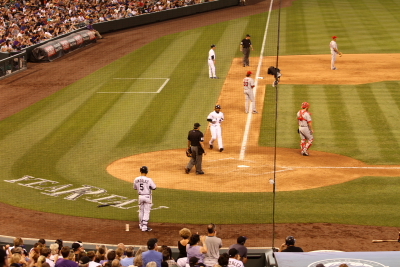 (2-0) before the Rox got up to bat. in the first. Hunter Pence at bat in the 1st. he got on base on a fielder’s choice. He than stole second. This is his hit. 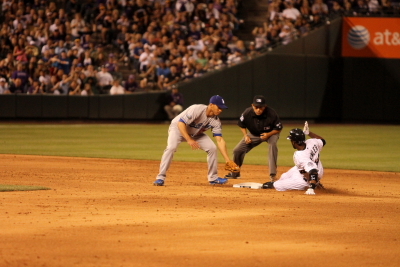 I like the dirt coming up where the ball hit. 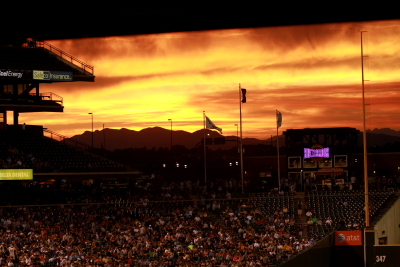 Another great sunset at Coors. 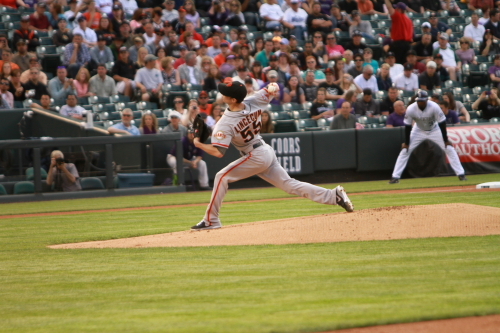 Ryan Vogelsong pitched for the Giants. The Sunset was still great in the 4th. 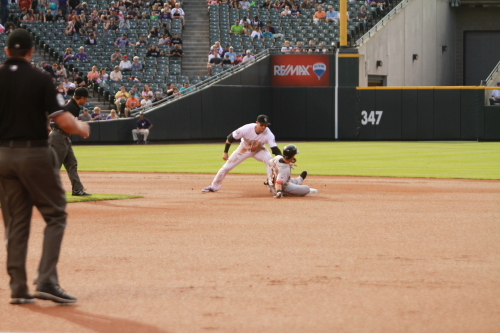 Tyler Colvin is on second and the Rox were down 3-0 at this point. Still a great sunset and still a lousy game! Marc Stout stole this photo for his profile picture on Facebook!!!!! Then I was on the move!!!! 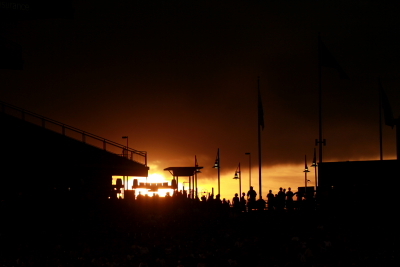 here’s one of the sunset from the concourse. I went visiting and sat with The Ranter in his perch in the Rockpile!! This is a photo of D.J. Lemahieu hitting the ball. In the 5th inning. He grounded out. 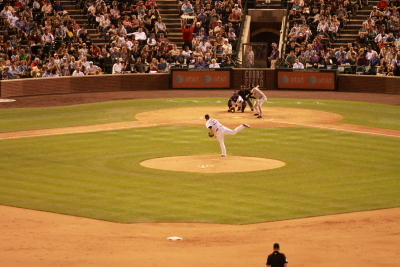 Here is Adam Ottavino pitching to Joaquin Arias in the 6th inning. Love the view of the plate from here. The Baby Bull Wilin Rosario went long in the 7th. Scoring himself and Helton. 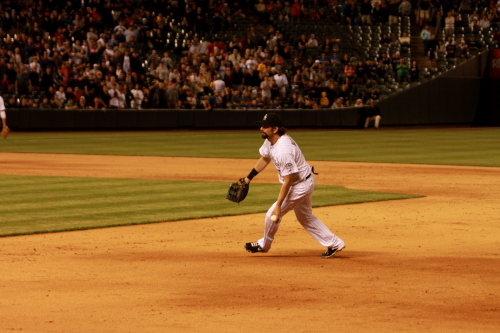 Helton got on base and scored Pacheco for his 569th double in his career. Pacheco once again hit a double to get on base. (7-4) Giants. The last 2 innings I headed down to the pavilions and sat with Eric. The Rockies completely fell apart well what ever was still together at that point they lost the game 16-4 The Giants scored 6 in the 8th. 3 in the 9th. There was some winning on the scoreboard. 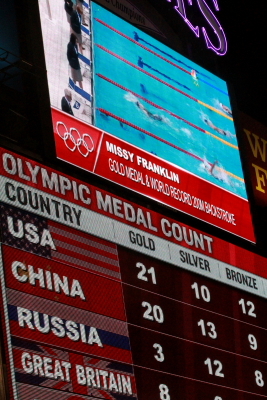 When the posted Missy Franklin record-breaking Gold Medal in the 200 meter backstroke. That is it for this one I will return to Coors on Sunday Stayed home saturday night The Rockies lost 11-6 getting better only lost by 5!!!! Some Links to check out. Hunter and Trout Fishing for runs! Batting Practice started off fast and furious with the Rockies hitting them out almost immediately. Carlos Gonzalez hit a few opposite field to the pavilions. The next group had Tyler Colvin and Chris Nelson in it Colvin hit a few out opposite field also and Nelly was crushing them. The Angel also hit many out I got 1 from them. Once again somebody got hit not paying attention out there. I can’t say it enough if you see people standing around with glove most likely there is a chance of a baseball being hit near, by or at you!!!. If you can’t catch it don’t try because when you miss it, it will hit somebody else. It has been very crowded out there so just keep an eye on the field. So I am going to make this one somewhat short! 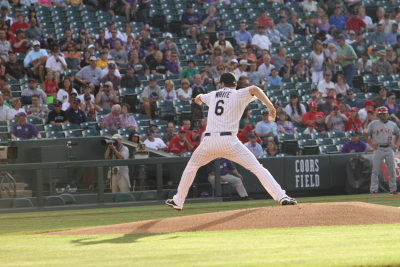 Alex White was the starting pitcher for the Rockies he pitched OK not to bad too good. 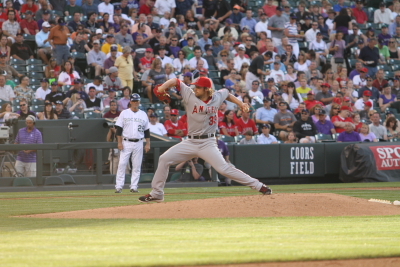 C.J Wilson was the starting pitcher for the Angles He pitched real well! Here is Tori Hunter batting in the 1st. He grounded out. He would hit a HR in the 3rd and 5th with Mike Trout on base both times. (4-0) Angles. He also had 6 of the Angels RBI’s. Hey look it’s Albert Pujols. He hit a double in the 3rd and 9th inning. 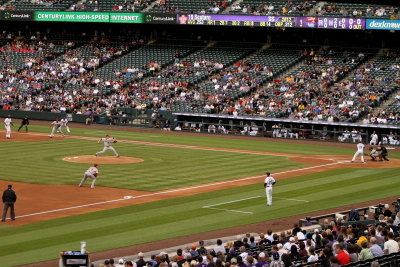 The Rockies were hit less against the C.J. Wilson for 4 innings. 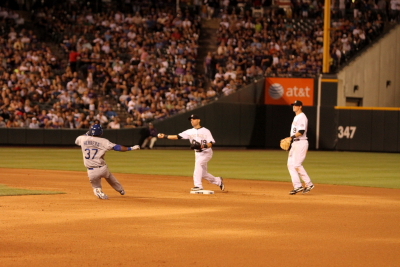 Helton made a great play in the 2nd to flip the ball to White to get Howie Kendrick out. 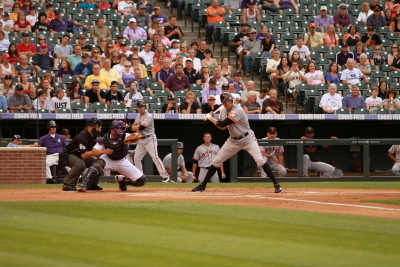 Michael Cuddyer sent one for a ride in the 2nd, but it was caught by Tori Hunter in right. Bob Apodaca heads out to the mound in the 3rd. after Alex White got roughed up. 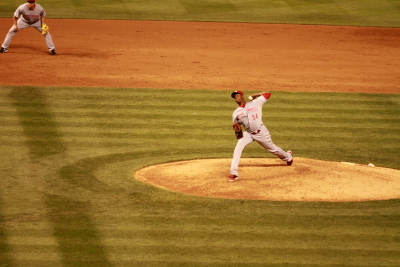 Wilson pitches to Dexter Fowler in the 4th, Dex would strike out all 3 outs were struck. 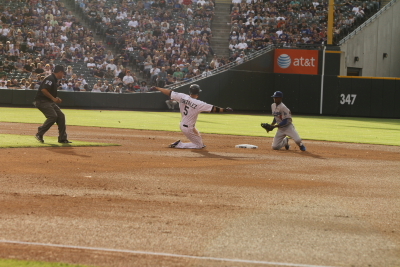 Cargo did break up the No-No if you can call it a No-No in the 4th with a bunt base hit. Helton would hit a double to lead off the 5th. That was his 565th lifetime 22nd all time in doubles. He would be caught tagging up at 3rd after a Jordan Pacheco fly out. 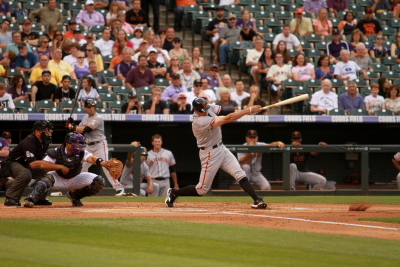 Marco Scutaro hit a double in the 6th to score Eric Young Jr. who pinch hit for White. (4-1) Angels. 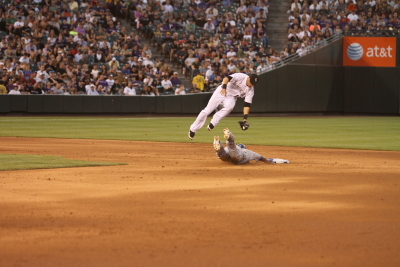 Marco Scutaro slides into second. 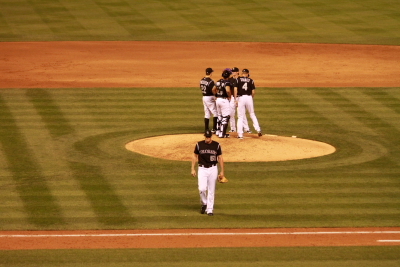 Esmil Rogers pitched in the 9th for the Rockies and was taken out. 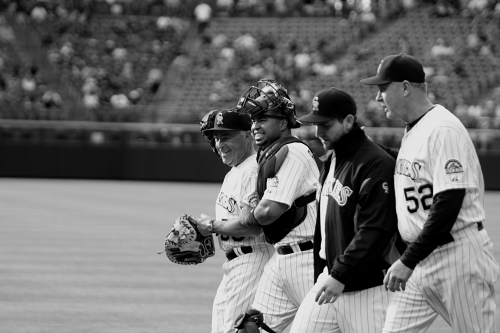 This may have been his last appearance at Coors. He was designated for assignment with no more options. 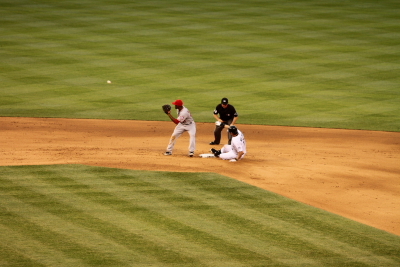 The Angels scored 3 in the inning(7-1) Angels Rogers started the inning strong but was haunted with 2 outs. after that the only person that did not get a hit off him was Mike Trout who he hit with a 90+MPH pitch. 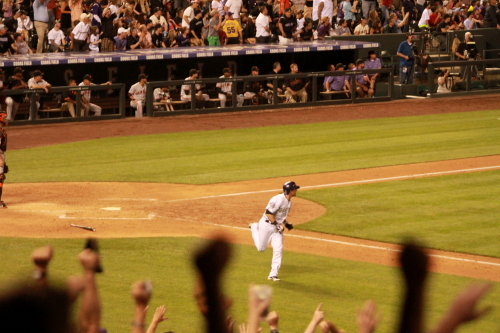 There was a ray of hope for the Rox in the 9th. With 2 outs Helton hit a single and Pacheco hit a triple to score him. (7-2) Angels. 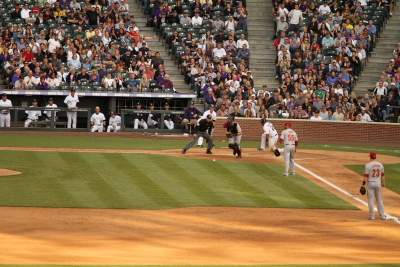 Wilin popped one up to shallow left that looked like may have been a problem, but wasn’t and was caught to end the game the Rockies lost. 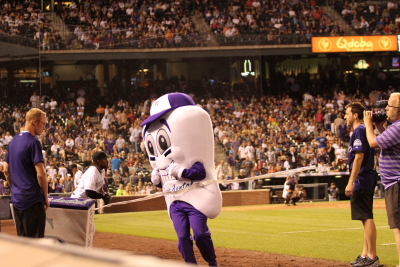 This was only the 3rd game I did not attend at Coors this year. Well another one is done. Only a few weeks away from my 2012 road trip. I will post a schedule soon, but I will say, It will kick off in Tulsa and I will be at 2 against the Rangers. 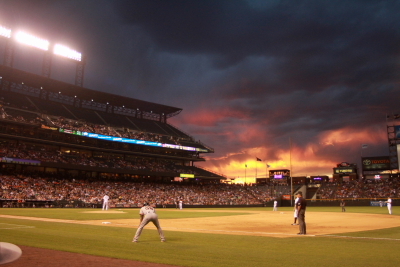 I will be at Coors for the remainder of the home stand so see you at Coors. My 26th game of the year. As usual the gates opened and the Pavilions where the place to be. Today the Rockies batting practice was a little light. The Dodgers did hit out a few. I was just in the wrong place at the wrong time and really did not get close to anything. This batting practice was filled with the morality of fans and players. And showed the contrasts of people. It started off early when a Dodgers player threw a ball to a kid who had a glove, the ball tipped off and a lady picked up the ball and walked away. This wasn’t like in Texas where the lady caught the random tossed ball this was someone taking a ball that was intended for a kid and tipped by him. That is just wrong if a ball is thrown to a kid give it to them. That is not how we do it. Then after a few long balls were hit by the Dodgers a young fan was hit on the top of his head and was a hit pretty hard. The sound was something you don’t like hearing. The ball did pass threw a few gloves and then bonked him. 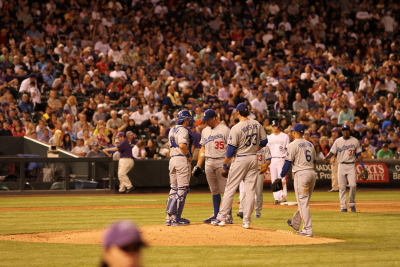 Within seconds Dodgers relief pitcher and ex Rockie Jamey Wright hopped into the stands and ran to the kid. Before security and the paramedics got there. He stayed with the kid til they walked away to get him checked out. Jamey did not just show the companion players have for fans and the concern that many players have for fans, thiers or the other teams. He not only made sure that the person who got the ball gave it to the kid but he also took off the glove he was wearing on the field and gave it to him. That is a true professional and I fully give huge props to Jamey Wright. That was one of the most stand up thing I have seen a player ever do. This just shows how some people are so rude and have no respect for others and how another person can go beyond what is expected to do the Wright thing. No that is not a typo!!!! Back to the kid the lady stole the ball from one of the Coors field regulars caught a ball and gave it to him once again showing the humanity and thoughtfulness of people. For me I got shut out this BP. 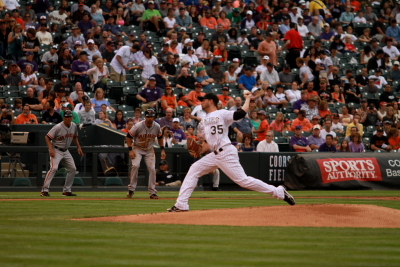 Josh Outman Started for the Rockies. 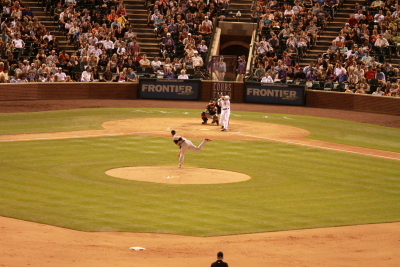 He pitched in the spot formally held by Jamie Moyer. Moyer was designated for assignment. Outman pitched well besides a hit by lead off batter Tony Gwynn Jr. and walking Matt Treanor in the second he struck out 4 before being taken out in the 4th. I don’t think it was a problem but he is just not use to pitching innings and was taken out because of pitch count. With 2 outs Carlos Gonzalez hit a single. 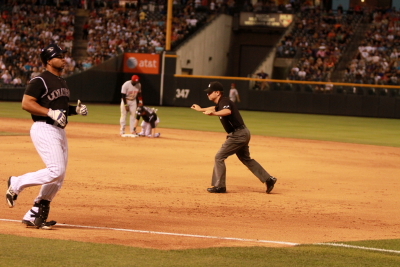 He was then caught stealing at second. The Rockies Got the offence going in the 2nd inning. 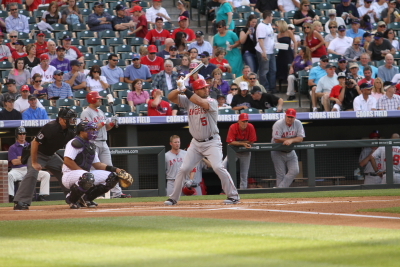 Michael Cuddyer lead off with a single. 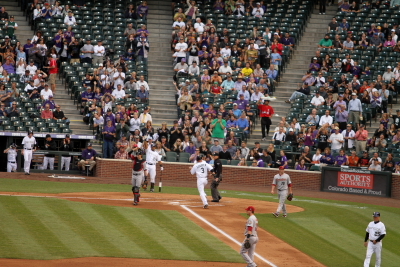 Michael Cuddyer sliding into second.He did score end up scoring the Rockies first run of the game.He and Wilin Rosario scored on an overthrow during D.J. 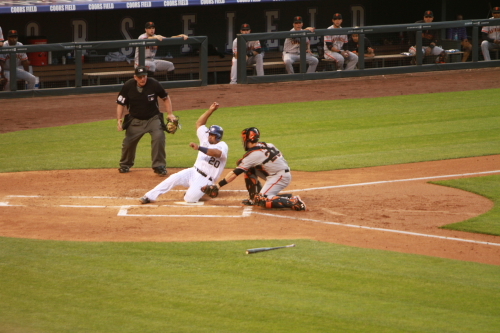 LeMahieus at bat in the 2nd. 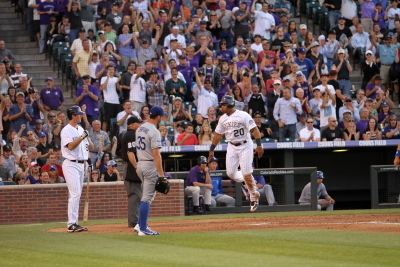 Wilin Rosario hops up after one of his graceful slides into home!! for the Rockies second run. 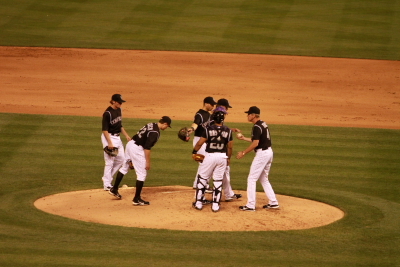 (2-0) Rox. 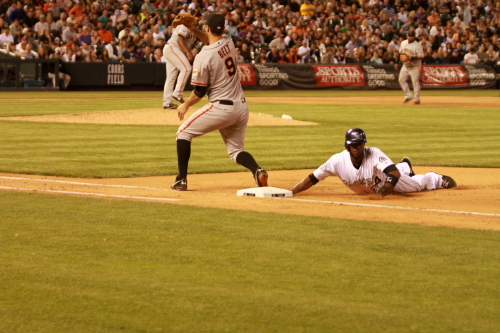 Tony Gwynn Jr. Dives back to first after his 5th inning walk. 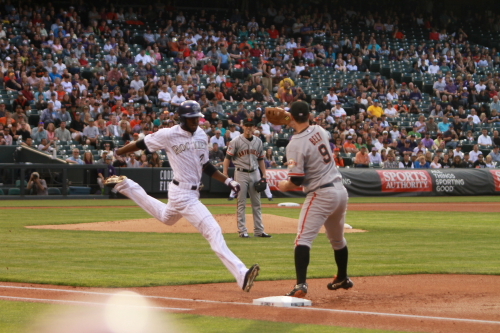 Marco Scutaro makes a jumping catch and tried to tag Gwynn as he steals second in the 5th. The Dodgers score 1 in the top of the 6th. 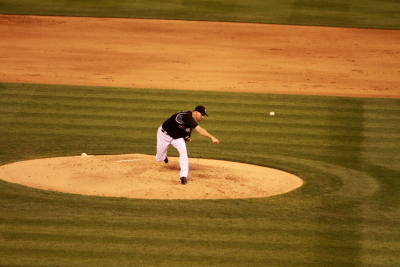 Helton started the 6th inning with his 663 double of his career. After Jordan Pacheco grounded out Wilin Rosario hit a 2 run HR. Wilin pumps his fist as the ball leaves the field. Chris Capuano bounces the baseball as Don Mattingly talk to umpires about a double switch. 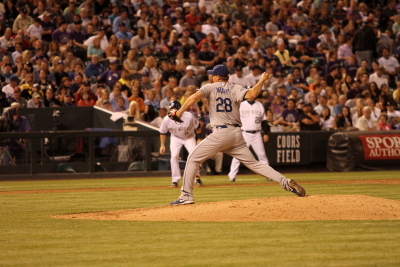 Capuano pitched 6th and a third and was taken out with a 2-2 count on our relief pitcher Adam Ottavino. 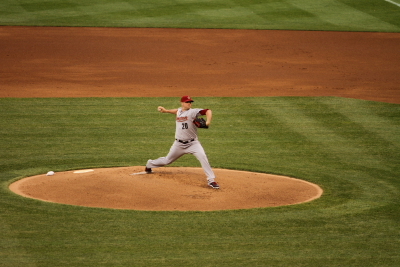 Jamey Wright came in to pitch for Capuano. Even know he was a stand up guy in during BP the Rockies got the best of him Scoreing 2 more in the 7th and 3 on the 8th. He was responsible for 6 hits and 4 runs in his 1 and 2/3rd innings pitched. 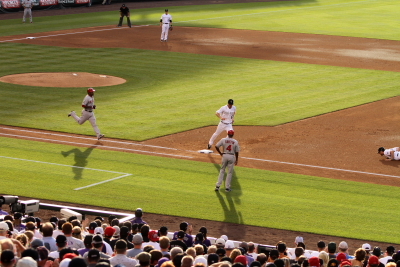 Dex running to first in the 6th inning. 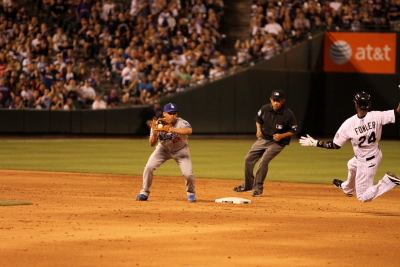 Van Slyke then tipped it and Dex ran to second. 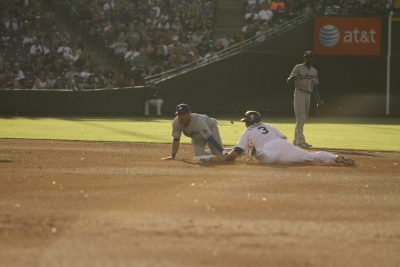 Ball being caught at 2nd and the slide. Scutaro steps on second and throws to first in the to Get Tony Gwynn Jr.
Dex walking off the field after being left on base in the 7th. I should change the blog Name To Following Fowler, feels like I am Talking a lot about him lately! He was 3 for 5 tonight with 2 RBI’s Is hitting over .600 this home stand and his average is now.294 Creeping up on .300. Go Get ’em DEX!!!!! 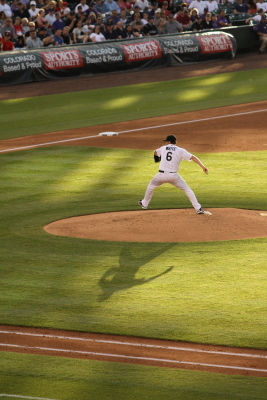 Matt Belise pitching in the 8th. Chris Nelson pinch-hitting in the 8th. 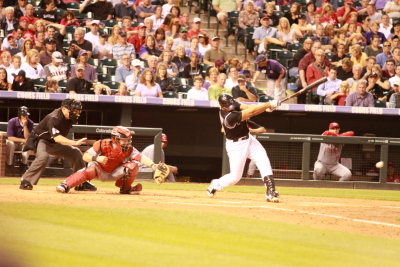 This is the swing before his HR. I had taken every swing he took and missed the last one for the long ball. 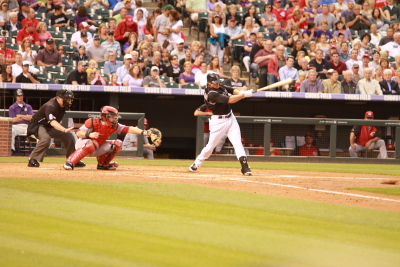 This one still works image it is about 30 seconds later and the ball is about 5 feet off the tip of the bat!! 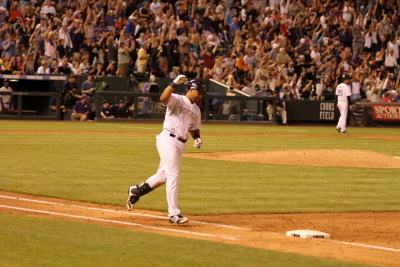 Ohh and he was pinch-hitting in the third spot for Cargo! 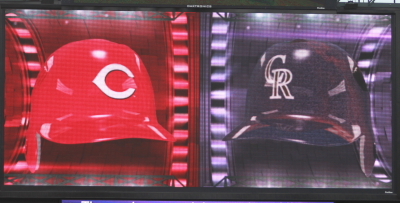 The Rockies WON this one 13-3. For their season high winning streak of 5 games what a home stand so far. 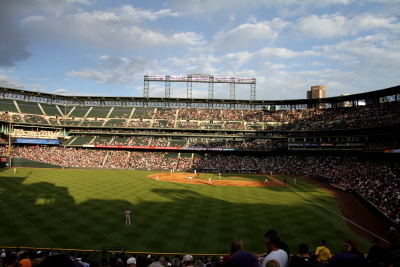 I will be back at Coors This afternoon. For game 2 of the Series. Tonights Pitching Match up Aaron Harrang for the Dodger’s and Juan Nicasio for the Rockies. well I will be there. See Ya at Coors. Cargo figures out Houstons launch codes!!!! My 25th game of the season. As always I headed to the Pavilions for batting practice not long after arriving I got a ball from Rockies. While the Astros batted I caught one leaning over the section divider rail. and not long after that a third, that was also a catch. The Second ball i ended up giving to a kid that was wearing a birthday cake hat. It was his sixth birthday. I believe his name was Philip. 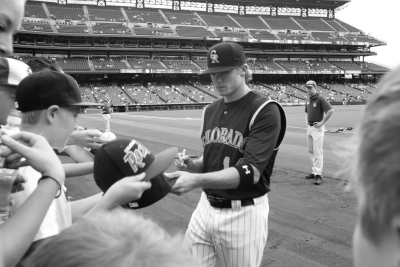 Hope He had an awesome birthday at Coors. Like usual I headed to the wall for autographs once again Jordan Pacheco signed and since he was at dex and friends earlier in the day I know don’t have much left for him to sign. I did get a photo of him signing this fans Jersey. The funny thing is the next morning I saw someone posted the photo from the phone to the left on twitter. Geoff had him sign a ball that he caught that Jordan fouled off. Jeremy Guthrie throwing the first pitch to Jordan Schafer. Schafer and Jose Altuve both got out. The next 2 batters Jed Lowrie and Carlos Lee both hit singles before Chris Johnson flew out to Michael Cuddyer to end the first. 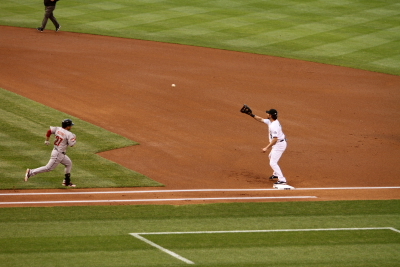 Jose Altuve being thrown out at first. 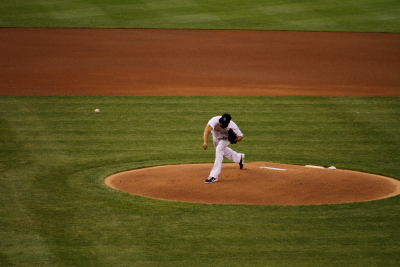 Bud Norris was the starting pitcher for the Astros. Dexter Fowler started the inning off right by walking. Dex once again has seemed to really gain patients at the plate and draws the walk aswell as hitting over .500 in this series. 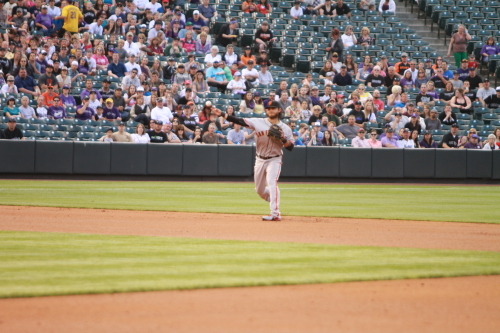 Marco Scutaro followed up with a single. 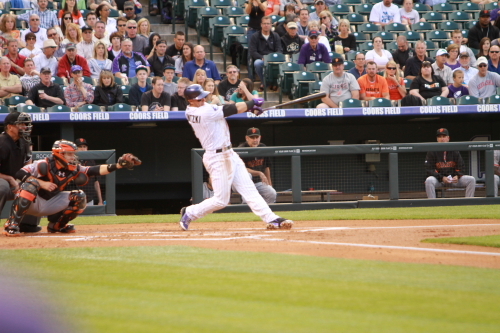 Once again Carlos Gonzalez came to the plate and for the 4th consecutive at bat he hit an HR. 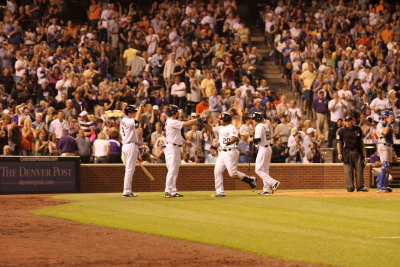 Cargo getting high-five from Todd Helton after his HR. 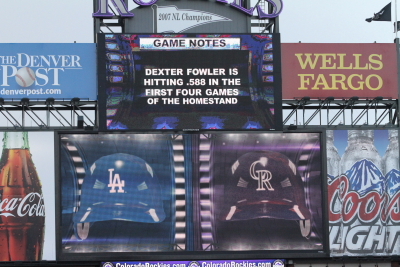 This was a Rockies record for consecutive at bats being HRs. This game I sat out in the pavilions in right field. I rarely sit out there it is always fun but doesn’t alway make for great photos. I always like the view from there before sunset. This is a view during Cuddyers at bat in the second. That is Dex diving back to the base. 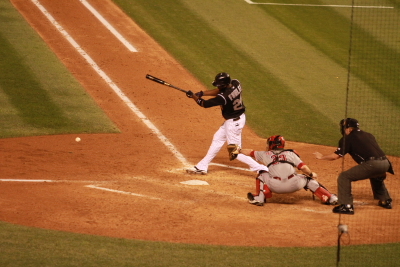 Wilin Rosario scoring in the 2nd inning. He got on base with a single and stole second. Ok the Rockies scored 4 runs in the second. 1 in the 4th and 1 in the 6th.. the Astros scored 1 in the 2nd and 3 in the 4th. I somehow don’t have photos supporting the play in those innings. 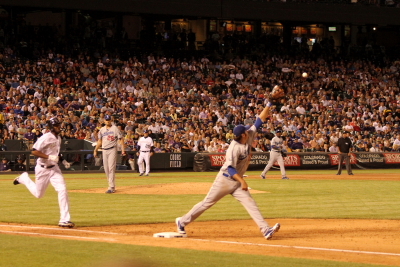 Here is Guthrie still pitching in the 7th inning and this was only his 79th pitch. He did let up a fifth run. 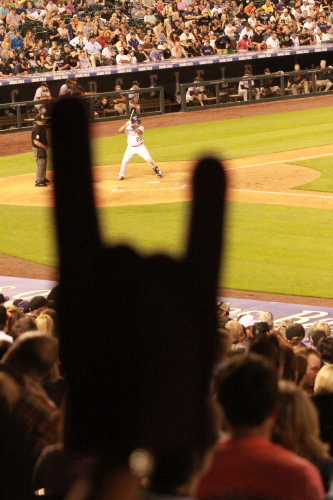 10-5 Rox. That Ruined my original title for this game which would of been Ten Four over and out but well the fifth run ruined that. 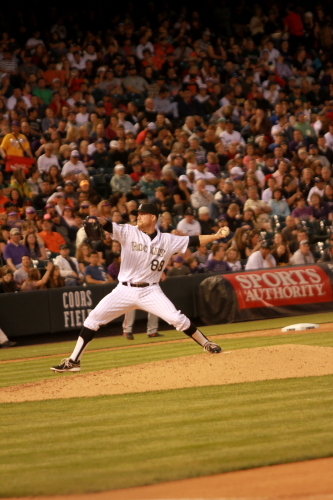 Guthrie finished the 7th and Matt Reynolds came in to pitch the 8th. Guthrie let up 12 hits, 5 runs and only stuck out 1. 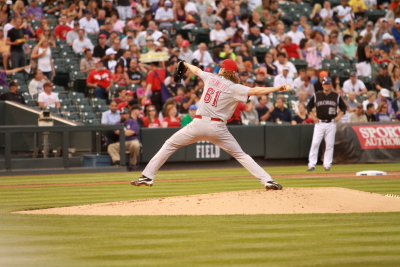 But it was a good performance for his since he has been having trouble pitching at Coors. Good thing he got some major run support. It is great seeing the offence get things going in this series. 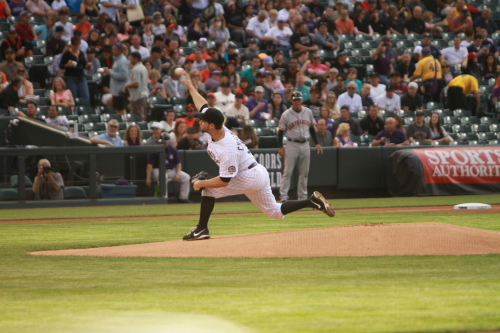 Matt Reynolds pitched a great 8th striking out the sides. 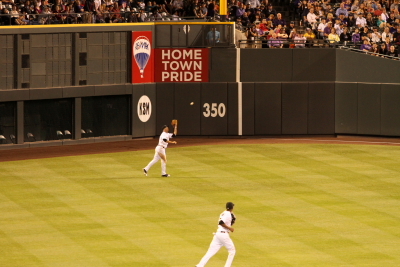 Cuddyer catching a ball to end the 7th inning. D.J. 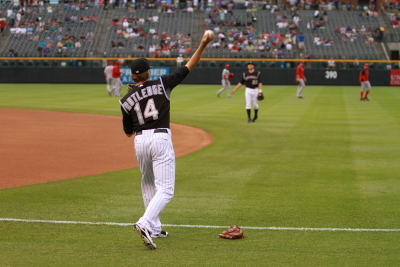 LeMahieu tosses to Helton for the final out of the game. 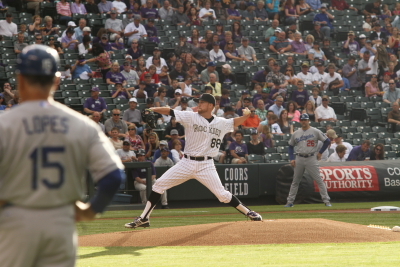 Josh Roenicke pitched the 9th for the Rox. 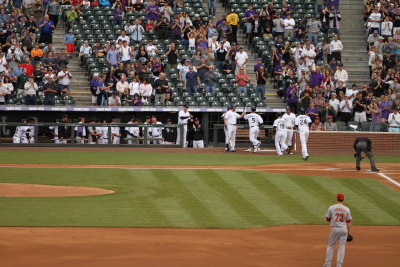 The Rockies head to the field from the dugout to celebrate the sweep!!! 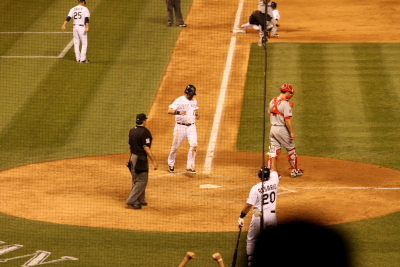 Roenicke and Rosario celebrate the win. The rest of the team gathers the 11-5 win by second base. …and is the creative BNW for this post. 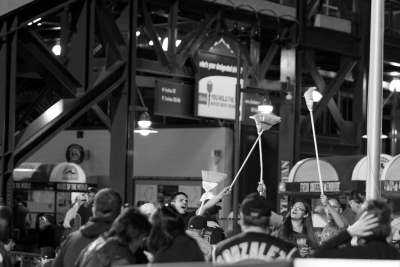 Break out the brooms it is a SWEEP!!! That that is it for this great series. Now the Rockies take on the Dodgers and thing are looking good. Hint hint since I am writing this after game one of that series!!! So thats it for th game. Now I mentioned dex and friends earlier in the post. Dex and friends is a Radio show on 102.3 ESPN radio on Thursadys when the Rockies are in town at Jackson’s on 20th and Blake across from Coors. Dexter Fowler and another player answer questions in person and talk baseball and the Rockies it is pretty cool this was the third time I attended. The first the other player was Jeremy Guthrie and the second time it was Chris Nelson. Todays guest was Jordan Pacheco. 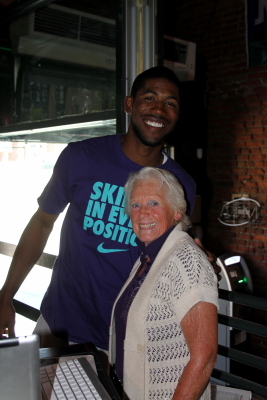 Here are a few photos from Dex and friends. 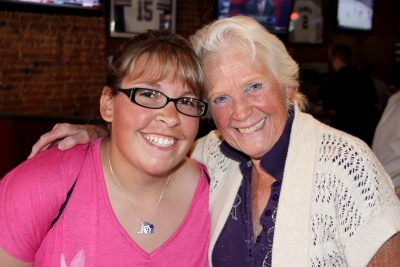 Mary and Amy where there. We all were a little late because we thought it started at 1P.M. but it started at 12P.M. This is cool because the players do sign some autographs and take photos I had the Photios from dexters walk od triple signed One of him at first with his fist in the air and another after he stopped at third and eveyone started charging at him. As well as the photo from his wens HR. All three photos can be seen on the previous 2 posts from those days. It was a cool day at Dex and friends and a Great night at Coors. I will be at Coors all weekend. So see ya there. Check back for the Dodgers game one post soon. 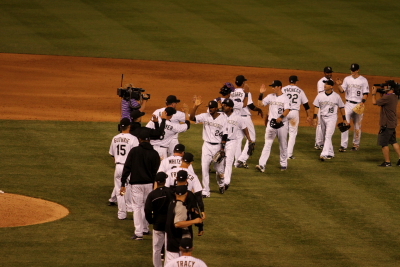 For now see you at Coors. Also I would like to congratulate The N.Y. Mets Johan Santana on getting the first NO Hitter in the history of the N.Y. Mets.